THEY will be the centers of attention in the upcoming PBA All-Star Game. 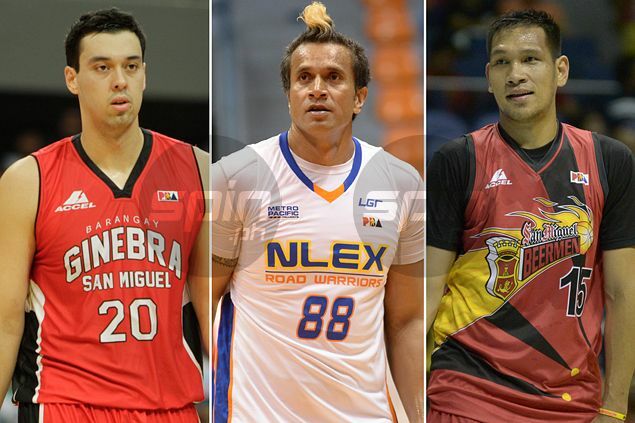 June Mar Fajardo, Greg Slaughter, and Asi Taulava are set to start for the South team after gaining the most number of votes in the fan balloting for the 2015 All-Star Game on March 8 at the Puerto Princesa Coliseum in Palwan. The San Miguel Beer star slotman, Fajardo emerged as the top vote-getter with 38,107 votes while Slaughter, the main man in the middle for Barangay Ginebra, finished second with 31,310 votes. Taulava, the ageless center for NLEX, rounded out the Top Three with 24,062 votes as the triple towers banner the South All-Stars of coach Alex Compton, who also has Purefoods backcourt duo James Yap (22,937) and Mark Barroca (15,197) to complete the starting five. On the other hand, athletic standouts headline the Leo Austria-mentored North squad. Hotshot Marc Pingris emerged with the most votes with 23,947, while Alaska energizer bunny Calvin Abueva followed suit with 22,670 votes. Japeth Aguilar of the Gin Kings completes the frontline after garnering 18,334 votes. The Kings’ Mark Caguioa (15,076) and Justin Melton of Purefoods complete the North All-Stars’ starters. The reserves for both sides will be picked by Compton, Austria, and the rest of the 12 league coaches. The All-Star Game highlights the All-Star Weekend from March 5 to 8, including the Obstacle Challenge, Three-Point Shootout, Slam Dunk Competition, and the Rookies vs. Sophomores Blitz Game.